Eclipse. If I’m not wrong, in a certain age of our lives, we all felt the bubbles in our stomach to watch it happen. Mostly, when we were kids ourselves. In the early ages, we didn’t know that much science behind it. Interestingly, many of us adults don’t don’t know about till this date. There’s a lot to learn, and it is productive fun for your little champs. So, it is quite obvious that you nourish yourself with adequate know-how about Eclipse, the types of it, why does it take place, and then, what are interesting about it. An eclipse is an astronomical event when one object in space blocks the observer from seeing another object from space. The earth revolves around the sun while the moon goes around the Earth in orbit. Our view of the sunlit part of the moon changes as the moon circles around the Earth, making the illusion that the moon shape seems to change. It is a natural event that takes place on Earth when the moon moves in its orbit between Earth and the Sun. Solar Eclipse happens on New Moon when the Sun and the Moon are in conjunction with each other. When the moon passes in the front of the sun, it causes a shadow to fall on certain portions of the Earth. Fun Fact: The eclipse is not usually seen from every place on Earth, but only from the locations where the shadow falls. From these locations, it appears as if the Sun has gone dark. There are three main parts of the Moon's shadow during an eclipse; called the Umbra, Penumbra, and Antumbra. Umbra: It is the portion of the Moon’s shadow where the Moon completely covers the sun. Penumbra: The area of the shadow where only a portion of the Moon is in front of the Sun. Antumbra: It is the area of the shadow beyond the point of the umbra. The Moon is entirely in front of the sun but does not cover the entire Sun. WHAT CAUSES THE SOLAR ECLIPSE? To teach your kid what causes the Solar Eclipse along with other important facts, here you have a video in YouTube. Total Solar Eclipse: A total eclipse is where the moon completely covers the sun. The portion of the Earth that is in the umbra experiences the total eclipse. Partial Solar Eclipse: A partial solar eclipse occurs when the earth moves through the lunar Penumbra as the moon moves between Earth and the Sun. The Moon does not block the entire solar disk, as seen from the earth. It is important to note that it is not advisable to look directly at the solar eclipse with naked eyes. Even though it appears darker on partial solar eclipse, the harmful rays of the sun can still damage your eyes. A lunar eclipse occurs when the moon passes through the Earth's shadow. It has the same three phases like the Solar Eclipse; Umbra (total), Antumbra (annular) and Penumbra (partial). Unlike the Solar Eclipse, we can observe the eclipse of the moon from nearly an entire hemisphere. For this reason, it is more common to see a lunar eclipse from a given location. Fun Fact: A lunar eclipse lasts longer compared to a solar eclipse. A lunar eclipse is seen from a more extensive area of the Earth than the solar eclipse. They can be viewed without any special equipment to protect your eyes. The lunar eclipse is not totally dark, as the moon will only reflect some sunlight that is refracted by the Earth's atmosphere. The light that refracted is reddish and makes the moon appear a dark brownish-red color. Penumbral: It occurs when the moon crosses only the Earth’s Penumbra. Partial: When the moon crosses partially into the Earth's Umbra, a partial Lunar Eclipse occurs. Total Lunar Eclipse: It takes place when the Earth comes between the sun and the Moon and covers the Moon with its shadow. When it happens, the Moon can turn into brownish red, earning it the nickname of Blood Moon. Unlike Solar Eclipses, Lunar Eclipses are completely safe to watch. You don't need any protective filters. It is not even necessary to use a telescope. You can watch the lunar eclipse with nothing more than you're your god gifted eyes. If you have a pair of binoculars, they will help magnify the view. The word “eclipse” comes from Greek word “ekleipsis’ which means abandonment or downfall. There is about five Solar Eclipse of any types that can occur on Earth within a year. The longest Solar Eclipse can last even for half a minute. Animals sometimes become confused and behave strangely during the Total Eclipse of the sun. Lunar Eclipse and Solar Eclipse always come in pairs, with the Lunar happening at the full moon and the Solar Eclipse two weeks later at the new moon. Solar Eclipses not only alter the temperature on Earth but can impact wind and weather patterns. 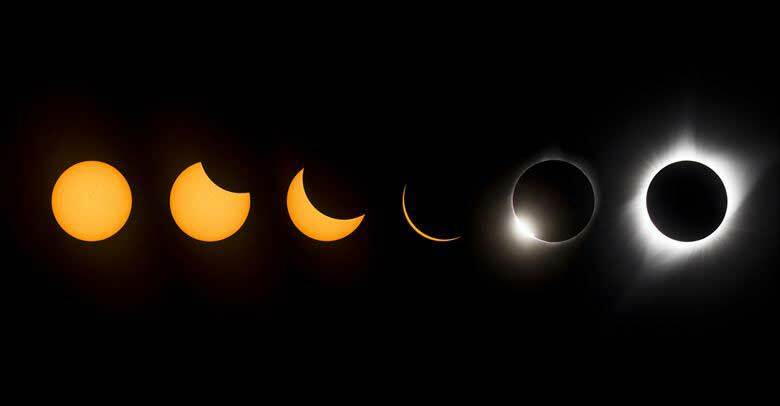 The alignment of the sun, moon, and earth causes an eclipse. It is called Syzygy. Here’s an animated education video for kids on Solar Eclipse by The Dr. Binocs Show channel on YouTube. The animation work is so good, that even an adult like me enjoys watching it repeatedly. LoL. DIY chunks are always fun, no matter what the age you are in. That fun is felt much more vividly when we’re at the tender years. Below are two DIY videos to help you kid go more productive and have fun learning about the Solar Eclipse. You will find a lot of other videos on YouTube. Let us know if you anyhow come across a more interesting DIY video that is worth including in our article.